WPPI Las Vegas Tips: 8 Tips for a successful WPPI experience! Here they are! My top 8 tips for a successful WPPI Las Vegas trip. 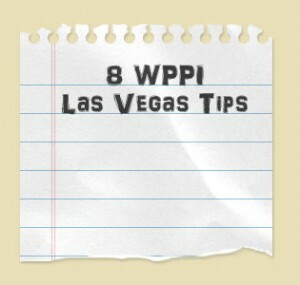 I hope these WPPI Las Vegas tips help you as well! If you’re worried about getting sick get some “airborne” pills. It’ll boost your immune system and you’ll feel better. Bring a Cliff/energy bar/meal replacement bar with you so you can have something to snack on throughout the day. They have water stations around the platform class area but just that extra food helps. Make up a business card that either has a different email address or just your website. Not as many vendors ask for them, but they try and build mailing lists from them sometimes and I hate getting tons of SPAM. Set aside a pre-determined dollar limit you want to spend and a list of business purchases you are planning to make this year. A new set of lights isn’t a good deal if you weren’t going to buy it originally. Also, many deals can be ordered after the convention in which you don’t need to make a rush decision on the spot. They are pretty good about not doing too high of pressure sales and usually they just want to get you on a mailing list, but still… Good to know your limits! Introduce yourself to and make a connection with the people sitting to your left and your right. Bring a sharpie marker and write on the business cards where you met and a little note to jog your memory. Each night record an audio note or journal about who you met, what you talked about, what your followup plan is, and anything that comes to mind. Daily dump. Take an audio recorder (or Evernote with your phone) and record an audio recording of your day. I basically spilled my thoughts and takeaways from each platform class or presentation you saw – and basically tried to give a blurb about everything I wanted to remember beyond that night. You could also journal these thoughts if you’re a writer. It’s helpful right after WPPI to make sure you didn’t miss things you wanted to do. And weeks/months later to re-listen to it and catch nuggets you forgot since then then The audio recording is just easier than writing for me. Sit 3-6 rows back near the center half. That’s where they throw most prizes. Last year I won $500+ worth of prizes alone. (Results may vary). Like school, you’ll also be less likely to fall asleep even when you’ve had 4 hours of sleep and perhaps a little too much to drink the night before. You’ll also absorb more information this way. Did I leave anything out? Share your wisdom and leave a comment below!